Despite numerous obstacles, the rationale for taking the road less travelled is a familiar story not only for Sloot but a growing number of Ontario home builders driven by the twofold desire to increase the energy efficiency and comfort of the homes they build, while reducing the carbon footprint of these residences. “I’ve always thought if people are going to live in a house for the rest of their lives, you should try to give them the best product available in terms of both quality and energy efficiency,” says Sloot. The pattern for builders pushing the envelope (literally) is for years they’ve been squeezed between regulations and pricing barriers on the one hand and consumers who have had a hard time wrapping their heads around the added cost of having a more energy-efficient home. And don’t even talk to them about having a smaller carbon footprint. Despite these challenges, Ontario builders continue to forge ahead with innovations rarely witnessed in other industries. Consider that a typical home built to current code uses 66% less energy than its predecessor in 1975 and only 50% of the energy used by a 2005 code-built home. And according to Gary Sharp, code specialist with the Canadian Home Builders’ Association, the bar will keep going up in five-year increments between now and 2032, by which time all new homes will be NZEr, or 80% more energy efficient than today’s homes! Getting potential homeowners to buy into those attributes is becoming a little easier of late, thanks to everything from rising electricity prices to the branding impact of EnerGuide (which was launched in 1978 by Natural Resources Canada using a scale of 0-100 to measure a home’s energy efficiency) and Energy Star-rated homes, which are approximately 20% more energy efficient than homes built to code. But while Energy Star has been a driving force behind both consumer buy-in and builder innovation over the past 5-10 years, there’s a growing sense that NZE homes will assume this mantle. There’s even talk of the two standards merging so that, for instance, by the time Energy Star reaches version 27 (they’re on a five-year cycle and currently moving to version 17 on September 1) it could essentially be the same as NZEr. So where will that leave us with Energuide’s 0-100 efficiency scale? As noted on Natural Resource Canada’s website, EnerGuide is abandoning the 0-100 scale of measuring a home’s energy efficiency in favour of a gigajoule-per-year (GJ/year) rating system. The new rating enables consumers to see their score using units of energy, similar to how they would see a consumption rating of kilowatt hours per year for home appliances, miles per gallon for vehicles or calories per serving for food. So how have things changed? According to CHBA, a typical Ottawa house built to Ontario code during the period of 1961-1977 consumed 343.2 gigajoules per year (1 gigajoule = 277.77 kilowatt hours). From 1998 to 2005, the total had dropped to 166.6 GJ/year, and by 2012 it was down to 116.8 GJ/year, or three times more energy efficient than homes built in the 1970s. As we head toward 2032 and the prospect of the building code being equivalent to NZEr, it will translate into homes that are 80% more energy efficient than even the current code. Brent Strachan of Minto can truly relate to these energy performance numbers of the Ottawa homes—not only because Minto is an Ottawa-based builder, but because they’ve been in the forefront of building technology over the decades as an early adapter in the construction of R2000, Energy Star, LEED and now Net Zero homes. “We’ve been active participants in advancing housing technology and for the most part, the affordability component,” says Strachan. Apart from significant advances with respect to insulation and airtightness, Strachan says one of the biggest contributors to building homes that are more energy efficient yet still affordable has been the significant drop in costs of products and technologies needed to build these homes. Other cost-effective, energy-saving innovations include spray foam to seal around doors, as well as pipe and wire penetrations, not to mention the whole concept of uninterrupted exterior wall insulation driven by the likes of Owens Corning. Reid’s Heritage Homes has adopted Owens Corning’s Foamular CodeBord Extruded Polystyrene as an exterior wall insulation solution for its Net Zero pilot homes in Guelph. In addition to having an R-5 value per inch and a compressive strength of 20 psi, the product eliminates thermal bridges to significantly minimize heat loss. And according to Jennifer Weatherston, director of innovation for Reid’s, in addition to placing a great deal of emphasis on the building envelope to get their homes to NZEr (80% more efficient than code), the proverbial ‘last mile’ of getting to NZE (100% more efficient) has been the combination of deploying the right mechanical solutions in tandem with heat pump and solar panel solutions. In terms of how all of these innovations will impact the environment and the carbon footprint of newly built homes, the upgrades to the 2017 code alone represent an estimated 80% fewer emissions than homes constructed in 1975, according to Weatherston. As the code transitions to Net Zero Ready from the current code, we’ll see another 57% decrease in greenhouse gas emissions. 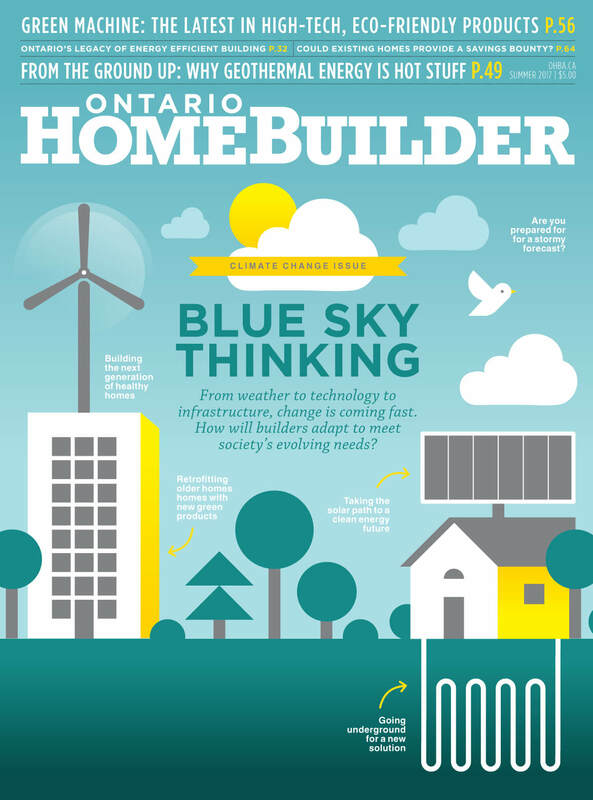 In spite of the leadership role of a select group of Ontario builders, combined with a building code that keeps evolving, there remains the perception that the province still needs to up its game in terms of providing more incentives for consumers to make them want to purchase more energy-efficient homes or upgrade existing homes. efficient homes from the outset versus opting to upgrade their home’s efficiency down the road.